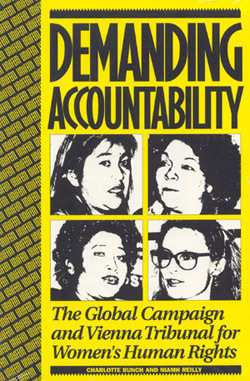 A broad and loose coalition of hundreds of women’s organizations from around the world, the Global Campaign for Women’s Human Rights kicked off in 1991, with a petition stating that “violence against women violates human rights” which called on the forthcoming World Conference on Human Rights (also known as the Vienna Conference) “to comprehensively address women’s human rights at every level of its proceedings.” The petition was initially circulated by the Center for Women’s Global Leadership (CWGL), the International Women’s Tribune Center (IWTC), and the World Young Women’s Christian Association (YWCA) as the first action of the 16 Days of Activism against Gender Based Violence campaign. Creating widespread awareness for women’s rights in human rights discourse, the petition was eventually translated into over 25 languages and circulated in 124 countries by over 1000 groups. The Vienna World Conference became the unifying public focus of this worldwide Campaign for Women’s Rights as Human Rights.